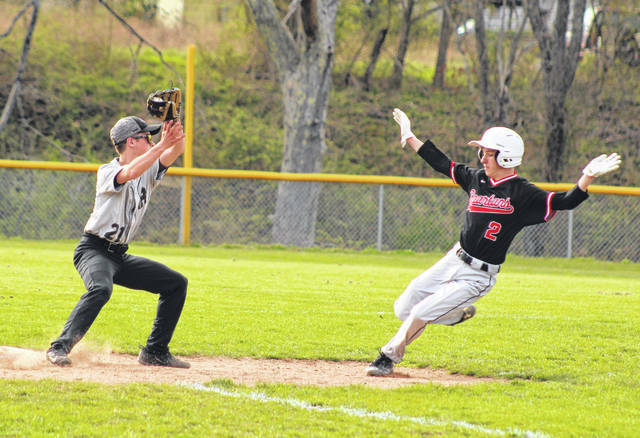 River Valley senior Andrew Mershon (21) hauls a throw to apply a tag on an Alexander baserunner during a fourth inning steal attempt Wednesday night in a TVC Ohio baseball contest in Bidwell, Ohio. BIDWELL, Ohio — It was all there for the taking. 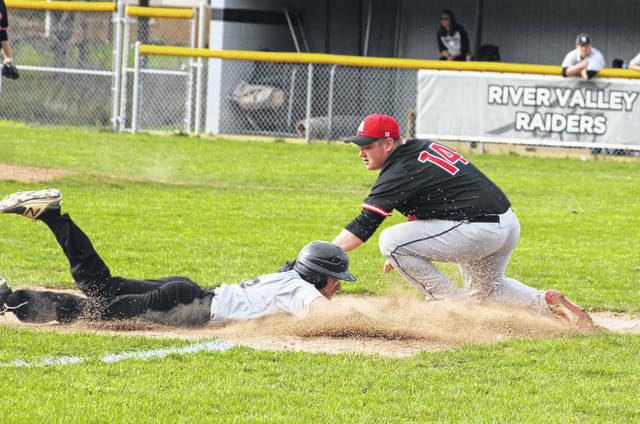 The River Valley baseball team stranded runners in scoring position in five different innings, plus left 11 on the bags overall Wednesday night during a 5-4 setback in eight innings to visiting Alexander in a Tri-Valley Conference Ohio Division contest in Gallia County. The host Raiders (0-8, 0-5 TVC Ohio) both trailed by a run and led by a run through four innings of play, then the Spartans (3-6, 3-3) won the fifth frame by a 2-1 margin to knot things up at four after five full frames. After a scoreless sixth, AHS appeared to have something brewing with the bases loaded and only one away in the top of the seventh. RVHS starter Chase Kemper, however, induced a ground ball to first for a 3-2 putout, then recorded a strikeout to get out of the bases-loaded jam. The Silver and Black started the home half of the seventh off with a leadoff double from Alex Euton, then Kemper received an intentional pass to set up potential force outs at any bag. River Valley, however, produced a pair of infield fly outs and then struck out to end the rally bid, forcing an extra inning still ties at four. AHS started the eighth with Jordan reaching on a one-out error, then Chapman delivered a two-out single that allowed Jordan to score from second for a 5-4 advantage. The Raiders had the tying run aboard second with two away in the home half of the eighth, and Blaine Cline answered with a single to right field. Chase Caldwell tried to score from second on the Cline safety, but the guests made a near-perfect 9-3-2 relay throw to the plate. Carsey applied the tag to Caldwell in a bang-bang play at home, where Caldwell was called out — allowing the Red and Black to hold on for the one-run decision. The Spartans led 1-0 through an inning of play, but Joel Horner doubled home Andrew Mershon in the bottom of the second to knot things up at one. AHS scored again in the third for a 2-1 edge, but the Raiders answered with two runs in the home half of the fourth to take their only lead of the game. Mershon singled in Horner for a two-all contest, then Caldwell scored on a groundout that provided a 3-2 advantage. The Red and Black plated two runs on a hit and two errors in the top of the fifth for a 4-3 advantage, but Zach Jones delivered a pinch-hit single that plated Kemper for a four-all affair through five complete. The hosts outhit Alexander by a 14-8 overall margin, but also committed all five errors in the game. 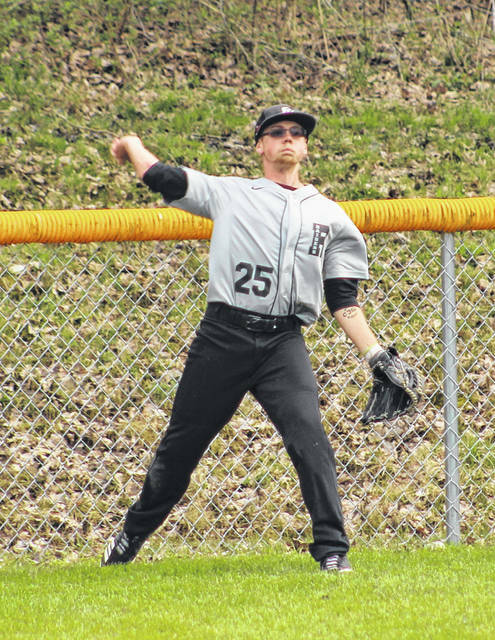 Truax ended up picking up the winning decision, while Kemper took the loss after allowing five runs, eight hits and two walks over 7.2 innings while striking out seven. 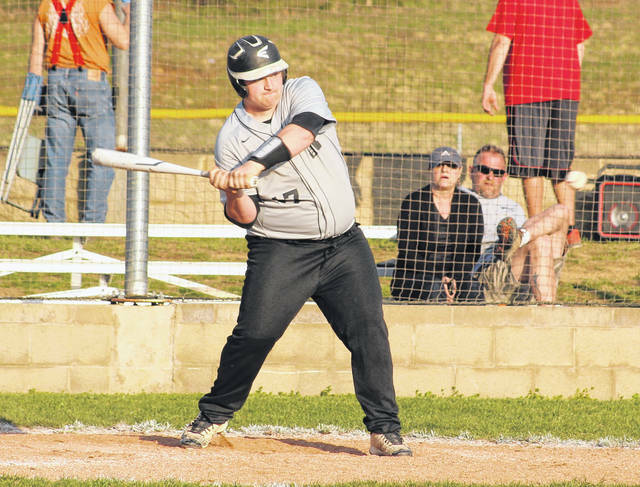 Caldwell led the Raiders with three hits, followed by Kemper, Dalton Mershon and Wyatt Halfhill with two safeties apiece. Cline, Euton, Horner, Andrew Mershon and Zach Jones also had hit each in the setback. Chapman and Phillips led Alexander with two hits apiece, followed by York, Bayha, Dille and Carsey with a safety each. Jordan and Phillips both scored twice for the victors. River Valley returns to action Friday when it travels to Wellston for a TVC Ohio contest at 5 p.m.